Why study Medical Engineering in Erlangen? The constant progress in Medicine obligates the field of Medical Engineering to search for innovative developments and improved processes. A medical engineer develops, improves, supervises and maintains medical devices and equipment for businesses and the health industry, e.g. innovative X-ray systems, radiotherapy units, ultrasound systems or surgical robots. These devices help in providing fast healing processes and accurate diagnoses and in effectively and successfully supporting physicians in their work. Other tasks of a medical engineer include technical service, as well as the training and supervision of personnel in handling medical devices. In the business sector medical engineers can also be active in sales and distribution, service, product management, marketing and quality assurance of medical devices. Our Master’s program prepares students for this challenging, interdisciplinary work environment by providing them profound engineering knowledge (mathematics, electrical engineering, computer science), specialised application skills, top-notch research opportunities as well as soft skills. It has been quality-checked and accredited by the German Accreditation Council. At the moment several institutions are active in the field of (bio) medical basic research: clinical research groups, a total of 20 collaborative research centres at Bavarian universities and 2 Transregio projects with a Bavarian university as a spokesperson. The Bavarian university clinics and medical faculties have spent a total of 181.6 million euro of (public and private) third-party funding in 2005. Through the government initiatives “Offensive Zukunft Bayern I/II” and “High-Tech-Offensive” it was possible to provide 429.8 million euro for university medicine and health research. Research results are directly implemented in new treatment methods and medical engineering innovations in Bavaria. A large number of the revenue-strongest medical engineering and pharmaceutical businesses were either founded in Bavaria or have their corporate headquarters or important branches in the area. With more than 250 medium-sized companies, it is hard to compete with Bavaria´s corporate expertise in Medical Engineering. Bavaria covers more than 60 % of the production of electromedical devices and 30 % of the German production of medical devices in general (source: Bavarian State Ministry of the Environment and Consumer Protection). You can´t discuss growth dynamics without mentioning clustering. With Siemens Medical Solutions and FAU University, Erlangen excels as a cluster for Medical Engineering. In no other region can you find a higher density of medical engineering expertise as in the 110.000 population city of Erlangen in the heart of the Medical valley. Almost one in four employees earn their living in the field of Medical Engineering and Health. The immediate proximity of excellent scientific force and the mixture of traditional and young innovative businesses prompts an excellent work environment for dynamic developments. The Franconian Huguenot city has now developed into one of the first-class regions in Europe thanks to the second largest alma mater in Bavaria whose School of Medicine is one of the most renowned in Germany, to the over 100 medium-sized businesses focusing on medical research and to the production and services of the global player Siemens Healthcare. It is a unique opportunity in Bavaria to have a close cooperation of the School of Engineering and Sciences. The new Nikolaus-Fiebiger centre for cutting-edge research in the interdisciplinary area of biology and medicine is a great example. Scientists and medical researcher work closely together. in which experts of the four university clinics for neurosurgery, neurology, ophthalmology and psychiatry work closely together and apply state-of-the-art technology. 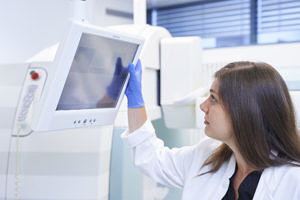 Maintaining and improving the high standard in quality is a high priority for Erlangen and the Bavarian government who provides large funds for research and clinical facilities. 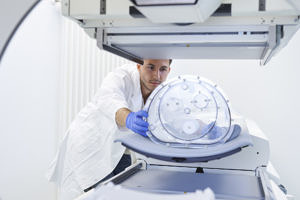 This unique scientific and corporate portfolio endorses Erlangen as an excellent location for ambitious research and successful product innovations. The city of Erlangen is a mediator who develops the structures for a close cooperation between business and sciences, provides networking and establishes forums to foster the existing cooperation and guarantee an even more successful future. For this matter local authorities initiate and support cooperation projects like the initiative “Medizin-Pharma-Gesundheit“ that establishes contacts between businesses, research facilities and clinics in the region and promotes the exchange of competence. Connecting the different participants of the Health industry provides optimal conditions for new start-up companies, for example the founding of the venture capital company for medical entrepreneurs. In cooperation with the Office for Knowledge and Technology Transfer a highly creative work environment with an extremely dense communication network has developed in Erlangen. This becomes apparent in the recent founding or settling of 60 new start-up companies, including award winning businesses like November AG, WaveLight or HumanOptics. Erlangen is home of the Bavarian Laser Centre, two Fraunhofer institutes and the Max-Planck research group “Institute of Optics, Information and Photonics”. An important milestone of Erlangen´s journey to become the world capital of Medicine is the construction of the Medical Valley Center (MVC). The 12.5 million euro construction in the centre of the city is a sign of determination and drive to further distinguish Erlangen as an optimal location for medicine and emerge to the top in European ranking (source: City council of Erlangen).